Today I was supposed to go to a lovely-sounding Daffodil Tea at Mini Minx’s nursery, but I spent the entire day pouring coffee down my neck and chasing around (school run, then Gym Teds half an hour away, then boringboringshopping half an hour away from that, meet The Boss for lunch, 40 minute chase back home, chuck cold food in the fridge, school run, stuff food down the minxes, half an hour drive to gymnastics, hang around for an hour, then back for dinner). This doesn’t include the Standard Daily Fights to have the girls dress and eat on time… I decided to do something about feeling overwhelmed (and knock 12 miles off today’s taxi route), so I ‘forgot’ the Daffodil Tea. Mini looked a bit crestfallen when I confessed what I was going to do. 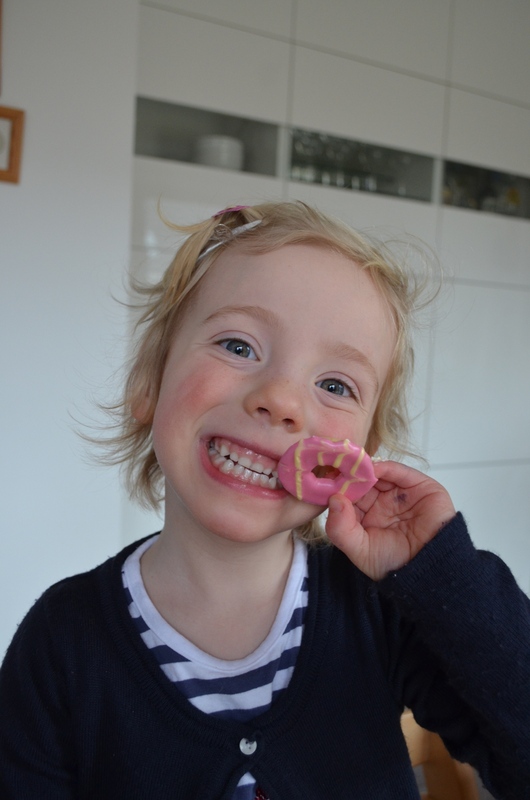 She certainly wasn’t on top form anyway – she’d come thundering into our room last night and clung to my neck for a few hours before she settled enough to go into her own bed at 5.35am. 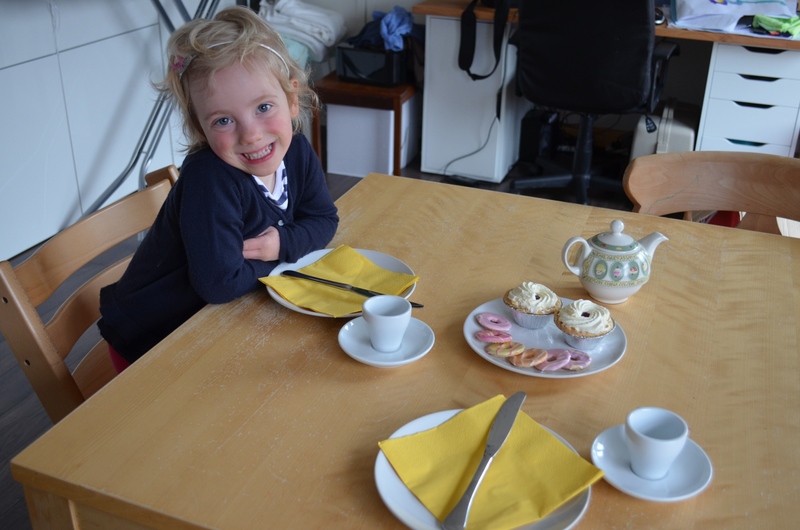 In a bid to cheer her up and make up for being selfish, I said we could have a tea party of our own. It was a surprise success! I bought some cheap strawberry tarts from the supermarket and opened a packet of Party Rings I was stashing for Maxi’s birthday next week. I put them on white plates, added some napkins that we’ve been hoarding for decades in case we ever have a dinner party again (maniacal laughter), got out some tiny cups and saucers (espresso ones – same future mythical dinner party) and put some fruit tea in a little tea pot. 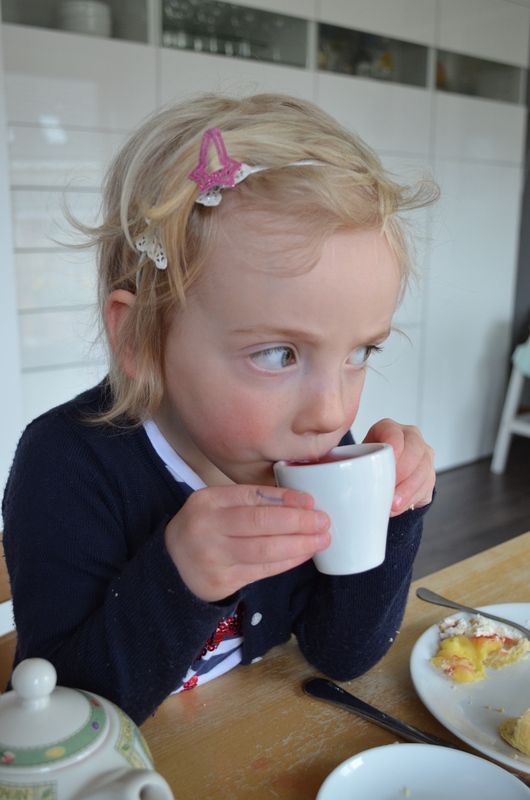 I helped Mini rip out the tea bag and brew the tea – the wee soul thought she had to empty the bag into the pot. I chose fruit tea because (a) I don’t want the minxes to drink tea and coffee when they’re children, and (b) it’s pink: perfect! I took out the bag when it was brewed enough then left it to cool in case one of the inevitable spillages happened quickly. After that, I sat back and let her pour me cup after cup of tea! 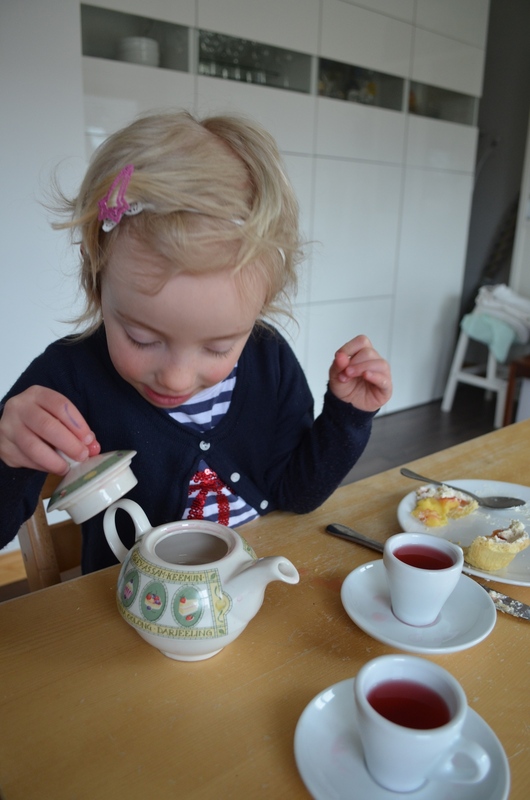 She was in Girly 7th Heaven: real tea pot, real (pink) tea, real (pink) biscuits and no sisters to fight with. She’s begged me to let her have afternoon tea tomorrow morning when her sisters go to school. “And I can make scones to go with a tea? A lovely big pink tea?” she asked. Oh go on. Go on, go on, go on, go on, go on. 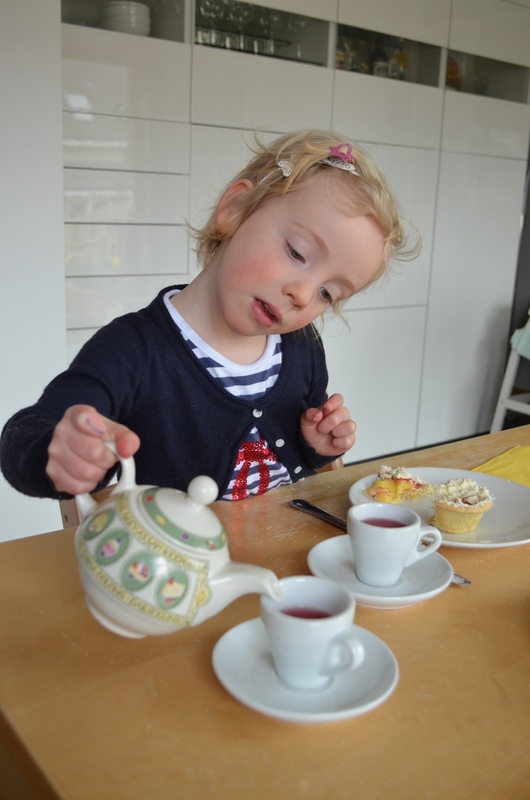 This entry was posted in baby milestone, cakes, Pollyanna and tagged afternoon tea, tea party by GrumpyOldTrout. Bookmark the permalink.